In this article, we highlight the current legal situation for the use of drones in Denmark. In Denmark, the legislation for multicopters has been tackled differently than most other countries. In Denmark, the regulations are subdivided into built-up and undeveloped areas according to the area of application. The built-up areas include all areas that are used for living, for leisure or for commercial purposes. As examples of inhabited areas, the Danish aviation authority cites sports halls, camping sites, harbors, and industrial facilities. Also, parks, beaches and other areas that are directly connected to an inhabited area must be counted to this area. Drone flights in built-up areas are only permitted with a drone license for a commercial purpose. Thus, such maneuvers can only be carried out after training in Denmark. Hobby pilots may allow their drone to rise only in undeveloped regions. Micro-drones: drones weighing up to 250 grams and a maximum airspeed of 50 km / h.
Small drones: Multicopters weighing more than 250 grams and less than 25 kilograms. The most common drones such as the DJI Mavic Air or the DJI Spark fall into the category of small drones. 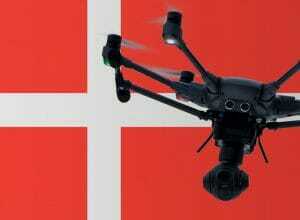 With the exception of micro-drones, all multicopters must be registered in Denmark (here in the English language). After registering you will receive a registration number which you must attach to the drone along with your name and telephone number. In addition to registering, you will also need to pass an online Drone Awareness Accreditation test to prove your ability and knowledge of the legal situation. After registering as a drone pilot in Denmark and proving your skills, you must comply with the following requirements. Maximum flight altitude: The maximum flight altitude in Denmark is 100 meters above ground in rural regions. There is a limit of 120 meters in cities. Maximum horizontal distance and FPV: Flights are only permitted within the visual line of sight. Compulsory insurance: For Denmark, you need drone insurance valid in the country, which will cover for possible damages of third parties. The policy must cover damages of at least 900,000 euros. Maximum take-off weight (MTOW): Drones are allowed to take off in Denmark up to a weight of 25 kilograms. From 7 kg upwards mass applies a minimum age of 16 years. Distance to airports: You have to keep 5 kilometers distance to civil airports and 8 kilometers to military airports. Other safe distances: Denmark has defined a whole range of safety distances. 50 meters to manned ships, boats and offshore installations (does not apply to micro-drones). 50 meters to uninvolved persons (does not apply to micro-drones). 100 meters to buildings without the consent of the authorized persons (does not apply to micro-drones). 150 meters to government buildings, embassies, police stations, prisons, probation facilities, military facilities, and similar facilities. 150 meters to police and emergency services. 150 meters to public highways and built-up area (does not apply to micro-drones). Flight bans: Flights over densely populated areas – including campsites – are only allowed for commercial pilots. Restricted areas can be checked in this map. The map is also available as an app (Droneluftrum by Naviair) on Google Play and iTunes. Flight approval: In all weight categories, you must apply for a drone license from the Danish Transport and Construction Agency, if you want to fly in a built area. For the approval, you must attend a class, pass tests, and demonstrate a practice of 24 flights with 4 hours of flight time in the last year. Time of operations: Night flights in settled areas are permitted only with special permission. In nature, night flights are allowed. Specific regulations: A minimum age of 18 years is required for flights in developed regions. Such maneuvers must also be documented in a flight book and kept for at least two years. Drone users younger than 12 years must be supervised by an elderly person. Regulations for commercial pilots: Commercial pilots must continue their education at an accredited company. From these training companies, you will receive a kind of drone license. Approved drone schools are listed here. Good to know: Although Greenland and the Faroe Islands are part of Denmark, the rules described in this article do not apply to these areas. Currently, these regulations from 2004 are legally binding for these regions. We have researched the listed drone regulations for Denmark to the best of our knowledge. We can not guarantee the correctness of the information. If you want to be on the safe side, please contact the competent aviation authority. Alternatively, you can also ask the embassy in your country for further information about the regulations. Please leave us a comment when you receive news and/or gain experience with your copter in Denmark! I will go to Greenland this summer to embarq on a sailboat. I will take a flight from Copenhagen to Upernavik . Do I need specific authorization to take my Mavic Pro in my cabin bag? Hey there, I wanted to clarify the following: I will be traveling to Denmark, Sweden, and Norway and will be bringing my drone with me. I am keen on using the drone only in Sweden and Norway but will be flying into Denmark Airport and traveling to the Sweden and Norway via Eurail. Having said that, do I still need to register my drone in Denmark if I will not use it? Can you please advise? Thanks! I think you do not need the registration if you’re drone stays in the backpack. Hi Francis, great blog! I was wondering. I’m going to the Faroe Islands next summer and will stop two nights in Copenhagen before taking the plane to the islands, but do not intend to fly my Mavic Air in Copenhagen. Do I need any kind of permit? Also, for the Faroes, they say you MUST HAVE an INSURANCE for your drone. Do you know anything about that? You may take your drone with you in Denmark as long it´s for private use, or else you have to contact a forwarder and then they can help you. Hi Sam, thanks a lot for taking the time to answer me. I think I’ll have no problems with the Air. Besides, I don’t intend to fly it in Copenhagen, only the Faroes. The Faroes regulation do say you have to have an ‘insurance’ for your drone. I’ve read other people say that had no issues entring the country with a drone, so maybe it is also just a formal regulation no one follows. Thanks a lot and cheers from Rio. Have you made your trip to the Faroe Islands yet? I am heading there next month an wantr to take my drone but trying to figure out the rules/laws. I too will not be flying in Copenhagen only in Faroe. Hey buddy, When i’m trying to fulfill the fields for registering, it doesn’t shows Denmark as country. Is that really right way to proceed? I’m coming to Copenhagen within December and i have a DJI Marvic Air, so what do i need to fly the drone in the city area. I am planning to buy an rc plane from hobbyking and wanted to know the rules of flying in copenhagen? Do I need to register for a license? The total weight of the aircraft is 3kg. Hi Everyone, I’m going to Copenhagen this weekend and wanted to take my Mavic 2 Pro. We will be staying in Hellerup and visiting Nyhavn, Frederiksberg and Norreport. I did the test but if I read it correctly I can’t fly my drone anywhere in central Copenhagen because the areas I mention above are all inhabited areas. But I also checked the Naviair map and it doesn’t show any restrictions in Hellerup. Dear Francis, I went through the BL9-4_uk which according to your blog still applys for Greenland. I am planning to use my small drone there in summer. I am not sure whether I need a drone registration for Greenland or not. Could you help out? My drone had small accident in Denmark and now flies only on 45 degrees up, and it doesn´t fly straight up 90 anymore, wanted to ask, can you recommend where I could fix it? Fast and Cheap?